Let’s talk! Give us a call, send us an email, or set up a time to stop by and chat about your project. Layouts, dimensions, and photos really help us get a feel for what you’re looking for. Now for the fun part. It’s time to play with colors and finishes to find the perfect look for your space. As we make the final selections, we establish pricing and a timeline to keep your project right on track. Time to bring it all together. 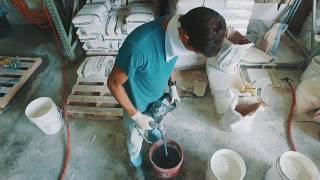 From casting to finishing and sealing, our talented concrete artisans get to work, turning your project into a hand-crafted reality. The best part! Our teams arrive with your finished product and install your new custom made pieces. We make sure you have all the information you need to keep your precast concrete looking like new for years to come. Watch our videos to learn about the versatility of concrete.